Say goodbye to "peak iPhone" and hello to the iPhone SE. Bigger isn’t always better. With the iPhone SE, Apple has designed a tiny smartphone that’s destined to become a gigantic hit. The device, unveiled during Apple’s “Let us loop you in” event Monday, looks like a totally amazeballs iPhone — and it comes with an Android-low price. Here’s why this little dynamo will take the world by storm. 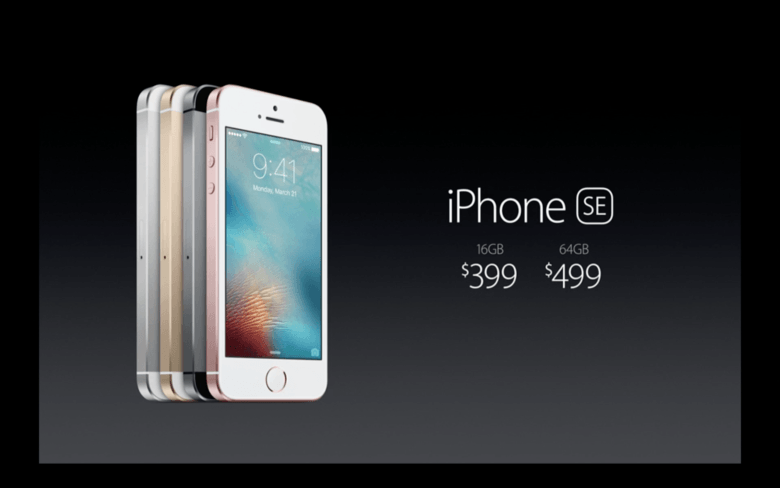 First and foremost, the iPhone SE price point is almost unbelievable — it was probably the biggest surprise of Apple’s presentation. Starting at just $399 for a 16GB model off-contract, it’s the cheapest iPhone ever to hit the market. For middle-class consumers with a bit of spare cash, it’s almost an impulse buy. And for the budget-conscious, it comes in free with a two-year carrier contract. That $399 price tag makes the iPhone SE the perfect replacement for anybody who accidentally drops and destroys their oversize iPhone 6s or 6s Plus. You could imagine somebody heading off on a trip, realizing in a panic that they left their phone at home, and picking up an SE at an airport kiosk. It’s not exactly cheap, but for a large swathe of people, it’s affordable. Setting the price below $400, and making it free with a cellular contract, could draw even more of Tim Cook’s swarm of beloved switchers, not to mention people in untapped markets like India and China. The iPhone SE could be the ultimate gateway iPhone. And then there’s the iPhone SE’s 4-inch display size. Some people don’t want a larger, heavier iPhone. I’m toting an iPhone 6 Plus, and I run into plenty of people who are impressed by that big, beautiful screen, but express reluctance to trade up from their smaller smartphones. Bigger isn’t necessarily better, even if you don’t have Donald Trump hands. An iPhone 6 or 6 Plus takes up more room in your pocket or purse and can seem downright ostentatious. The phablet-size phones have been winners for Apple, but some people want a more discreet device. The iPhone SE could prove popular with runners and gym rats who need something to pair their Apple Watch with, but want an iPhone that’s more compatible with their exercise routines. Apple’s still been selling loads of its 3-year-old iPhone 5s model, and not just because of its diminished price tag. Some people just don’t want a gigantic phone, and now they can get a “right-sized” iPhone with up-to-date innards. When it comes to specs, the iPhone SE is damn near untouchable. It runs on a powerful A9 processor (same as the iPhone 6s and 6s Plus), and its M9 motion coprocessor means Siri is always listening for your commands. The SE also boasts the iPhone 6s line’s faster Touch ID, Apple Pay support and a 12-megapixel iSight camera with Live Photos and 4K video. There are a few tradeoffs: Like with the iPhone 6 line, Touch ID on the iPhone SE is powered by the slower, first-gen sensor. And the SE’s FaceTime selfie camera captures 1.2-megapixel photos, a step down from the iPhone 6s line’s 5-megapixel cam. Also, on paper, the screen’s a little less impressive on the iPhone SE. But the only thing the new device is really lacking is 3D Touch. Check out the iPhone SE specs on Apple’s site, and you’ll see it’s no slouch when compared to all the other iPhone 6 models, which cost far more money. Here in the Cult of Mac office, we can’t wait to get an iPhone SE into our hot little hands. We’re anxiously awaiting Thursday’s preorder day. If switching between a Plus-size iPhone and an iPhone SE is as easy as popping a SIM card, what’s to stop us from using the giant iPhone when we’re hanging out around the house and moving to the smaller model when we head for the gym or our next European vacation? This could be the dawning of the dual-iPhone era. With its killer specs and shockingly low price tag, the iPhone SE could be a tiny solution to the big problem of “peak iPhone.” It’s the exact opposite of the iPhone 5c, which packaged underwhelming internals with a cheap plastic body without much of a discount over the flagship iPhone 5s. Our prediction: Even noted name-caller Donald Trump — he of the short-lived Apple boycott and the tiny, tiny little hands — will be calling the iPhone SE a winner.